More than just basic transportation, the 2017 Mazda3 at Island Mazda near Freehold, New Jersey is an entertaining, versatile and classy car to drive. The 2017 Mazda3 gets a variety of updates this year. Both the front and rear fascias are subtly restyled, while the interior has a new steering wheel, an updated dashboard design, added standard equipment, bigger door storage pockets, and a new electronic parking brake. The 2017 Mazda3 at Island Mazda near Freehold, New Jersey is powered by one of two different engines. The first is a 2.0-liter four-cylinder that produces 155 horsepower and 150 pound-feet of torque. It drives the front wheels through a six-speed manual transmission or an optional six-speed automatic. Standard on the Touring 2.5 and Grand Touring is a 2.5-liter four-cylinder engine generating 184 hp and 185 lb-ft of torque. Standard safety equipment on the 2017 Mazda3 includes antilock disc brakes, stability and traction control, active front head restraints, a rearview camera, front side airbags and side curtain airbags. 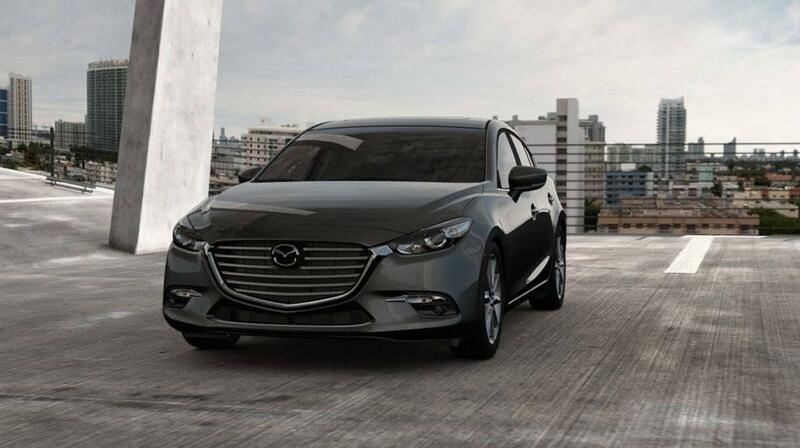 Come into Island Mazda near Freehold, New Jersey today to test out a new 2017 Mazda3! The well-shaped front seats keep driver and passenger snug. All models now feature Mazda Connect — a dash-mounted 7-inch touch-screen display and control dial between the front seats. Other dials and buttons for climate and audio are also intuitive and easy to use. Rear-seat legroom is on the low side, but there’s still room for two average-size adults, three in a pinch. All models have 60/40-split-folding rear seats for further versatility. Mazda3 hatchbacks boast over 47 cubic feet of room with seats folded. Whether as a 4-door sedan or 5-door hatchback, the 2017 Mazda3 has knockout styling. The versatile Mazda3 hatchback is noteworthy for a design that should win over those who usually don’t equate hatchbacks with beauty. Up front, the Mazda3 for 2017 is revised slightly, with a more streamlined grille and headlight treatment, new side-mirror design and, on Touring and Grand Touring models, new 18-inch wheels. The hatchback receives revised styling at the rear, as well. The sedan features a deep trunk with a wide-opening lid, while the 5-door hatchback’s liftback gate makes it easier to load long or bulky items. Click here to learn more about how to get a new 2017 Mazda3.